Let me start this off by saying that if age was based on my style, I am definitely not 26. I like to be in bed by 9pm, I don't particularly like to go out, my hem line is typically below my knees and I love a good romance novel. What I'm trying to say is that I think I was born in the wrong decade. My style would fit in better if I was born in the 20's with my grandparents. I had always felt a little shy about my style until I came across the beautiful Julia Engel. If you don't follow her on every social media platform, you should. She is, to me, the definition of classic, old school beauty that has everyone coveting her most used beauty products and makeup. When I first came across her instagram, I noticed a lot of her pictures were taken in my hometown of Charleston, SC. Picture The Notebook, and Julia reminds me of Allie for everything from their style to just how natural they are. Now, Julia is one of the top 5 bloggers I follow & I has helped me to embrace my style and not try to fit in with todays standards of style (not that there is anything wrong with them, it just wasn't me). 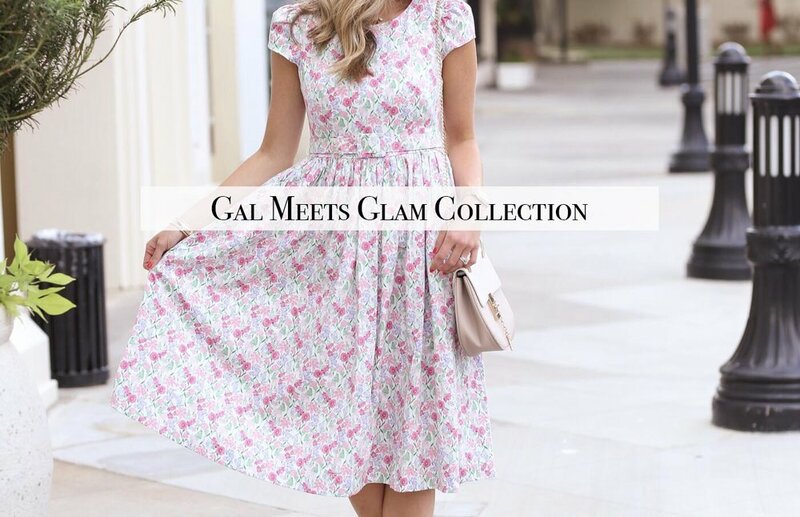 About two months ago, I saw on Julia's instagram, @galmeetsglam , that she was launching her first ever collection of dresses that are completely affordable. I was so excited because I knew I would love them! Counting down from the 37 days prior to launch, I was beginning to get ancey! Finally, the collection launched and the dresses sold out completely, some within hours, others within days. Since then, she has had two other collections launch and I now own 3 of her dresses and plan to wear them for the next 40 years (I wish I was kidding, that's how timeless her designs are). Whether you are heading to a wedding or running errands around town, all of the dresses fit any occasion. I wanted to share with you two of the ones that I currently own (yes, I plan to own every single one as soon as I possibly can), but I thought it would be useful to show you how they fit on me! Below that, I have linked some of my favorites from her collections for you to shop!